Test your mic and avoid a wasted session. It makes sense to test your bat recorder or bat detector equipment prior to use. Microphones can degrade with time, the main enemy being humidity, or worse still total saturation. So far, I have found that over a 5 year period I have no customers with failed microphones where they are using handheld equipment. I am sure they are all still working fine, but worry that they might be degrading and the user is unaware. Static equipment left out in the weather is a different matter. I have observed totally dead mic's, and again more concerning some that have started to lose the top end response after a year or so of use. So here are some thoughts on how to test your equipment and be sure it is going to be effective, with cost in mind. If you are a casual user why not just jangle keys. A detector will give you a response, but you just don't know how well it is operating over the frequency range. 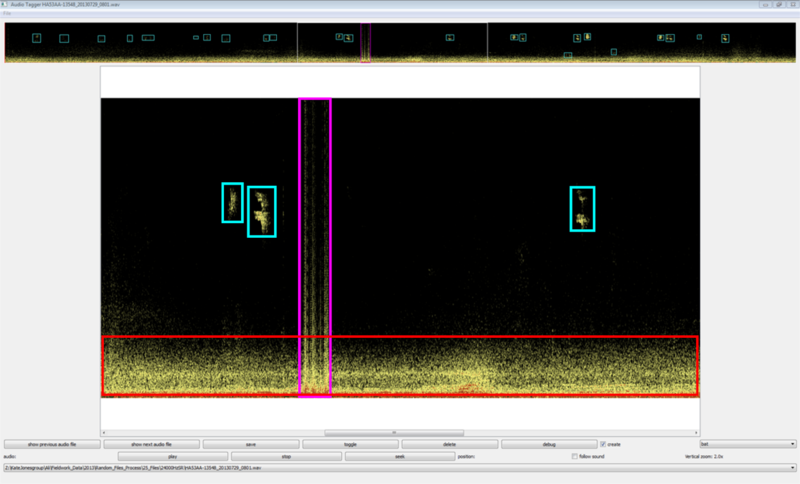 Jangling keys is better if you have a recorder, the stimulus can be recorded and the response viewed as a spectrogram. Here is a spectrogram of key jangling,I tried with different bunches of keys and found that on the whole the stimulus was covering the spectrum well up to about 110 kHz. Although it is not a repeatable signal. A better test would be to use a definite fixed frequency, generated from a signal generator, a specific sine wave , or series of waves played back through a tweeter can give a measurable stimulus. Use a sine wave rather than a square wave as the latter contains many harmonics and it would be nice to observe the response at each frequency step as far as possible. Signal generators are standard electronic test equipment. They are usually around the £150-£200 area, but there are some lower cost kits too that might be as low as £50. A low cost China manufactured sig gen at a bit less than £150. Next you need to select a speaker/ tweeter. These are never designed to cover the full bat spectrum, so some trials and selections are required. However they are not costly. There are voice coil speakers which are fairly level over 20kHz to 90kHz, Or pietzo speakers that will go much higher, both will suffer from features over the band so this needs to be considered. - There is no perfect flat response. Now it is possible to chose a selection of signals, at predefinied amplitude ( volume ) and set up your own regular test pattern. Just test and record, and observe and trends in the recordings that suggest deterioration over time. Having found that a microphone is deteriorating, typically at the higher frequencies. You might want to calibrate it. You can't. A mic that is on the way out is best consigned to the dustbin. This should not be confused with the process of matching a mic to a recorder by equalisation. That is fine, but not a great idea if the mic is becoming unreliable. Manufacturers vary, if you are able to replace the internal mic element this should be cheap, if the mic is a unit, you will need complete replacement. So from the lower end ( replacing the insert) to replacing the unit, the cost would be anything from £12.00 to about £300. Rather than go for a test equipment based arrangement, you could do better by obtaining an ultrasonic mic tester as a unit, speaker included or integrated, with features specified in the suppliers data sheet or users manual. Should make life easier. Some testers emit a spot frequency, 40 kHz, 60 kHz. This will certainly show something, but what about at 125kHz? Or the various points in between? Best thing then is to emit a series of stepped frequencies. Also a chirrup is useful as it gives a fast changing signal and your spectrogram will show up some missing points perhaps. Stepped frequencies will allow you to check your heterodyne or FD equipment at each point, a full range of patterns is even more revealing for recording FS gear. At Peersonic I have developed a tester that emits single steps over the range, plus patterns, and for fun some emulated familiar bat sounds. Speaking to my competitors I find there are fixed frequency testers, and I note the Titley "chirp" equipment, which is similar , but moves on to offer a complete test bench that ensures the speaker and receiver are at a fixed distance from each other. Try to keep the following the same each time for best results. Try to ensure that the furniture is in much the same position each time. Do not stand next to the speaker, or in front, best to operate from behind the setup..
Avoid wearing wooly pullovers as they are absorbers of sound. If you can, check that there is no electromagnetic interference, (a desktop PC with the sides off tends to transmit all sorts of rubbish). Or test outside in an open space. Testing your mic is a bit like backing up your computer. Unless you are running a schedule, it really only happens when its too late. I’m a conservationist by instinct, because I love the natural world. But like many I now worry seriously about climate change, loss of habitat; you know the issues as well as I do. We can all make a difference. As a photographer I’m naturally interested in the pulling power of good images in conservation. I’m really an underwater photographer by trade and have photographed so many interesting subjects, from trout and grayling in Hampshire chalk streams to blue sharks off the coast of Cornwall and silky sharks in Cuba. Looking for a new challenge, I saw bats hunting over water whilst photographing trout and thought there was scope to do something different. I could not have found a harder target! The problem rightly started with the bats’ protected status and early in my research I contacted the Bat Conservation Trust and started a helpful dialogue about my project with people there and at Natural England. Although the chosen approach did not require a licence, I inevitably ended up with self-imposed restrictions, principally about levels of artificial light. The lovely Daubenton's bat (Myotis daubentonii) has that super-cool trick of intercepting an insect just as it hatches at the water’s surface. But I also wanted to show the bat’s hunting flightpath and habitat. The technical challenges soon kicked in. I developed two techniques that were gentle on the bats. Low light (flash guns at minimum power) and infrared (almost invisible to human and bat eyes). Infrared opened up new creative possibilities and I used a constant light, flash guns and cameras all modified to specific infrared wavelengths. You need millisecond precision to catch the action so I opted for a laser trigger with the beam riding a couple of centimetres above the water. My route to success was littered with a thousand failures, because making this work in the dark was tricky. Not least because I had to power the infrared lights with 240 volts using a 12 volt car battery and inverter, all mounted on tripods over water. It was an interesting risk assessment! But persistence pays off. I might have given up one night when I stood waist deep in water for almost five hours. The bats were swarming around me chasing a massive hatch of insects. But not a single picture was useable. Utterly dejected, I discovered in the analysis next morning that I had made a silly mathematical error in my trigger calculations. After fourteen months, over a hundred night field trips and countless other hours modifying the camera trap in my workshop, it came together in a beautiful image. I call it ‘contrails at dawn’ and it won the British Wildlife Photography Awards 2018 (you can see the image here: https://www.bwpawards.org/winners2018). The Bat Conservation Trust is already using it to draw people in to the bat conservation story. So now I have a request for bat conservationists. Where can I go to document different species and the wider stories behind bat conservation? It must start with powerful imagery of the bats themselves, because that is what will hook people in. I now have an excellent suite of new photography techniques to exploit, but remain open minded about new potential subjects and stories. I’m keen to get involved with people who already hold the appropriate licences. If you would like to work with me in my quest to raise the conservation profile of bats by using powerful imagery, please do get in touch and offer me some suggestions. I cannot promise to work with everyone due to my busy programme. But I’m determined to work with some who might help me create good stories enhanced by the pulling power of new imagery. I am always a bit apprehensive before bat walks as there is always the weather to contend with in Scotland! But, it has to be said, bats have never disappointed me. They are hardy little mammals and they put on a good display for us as we walked around Holyrood Park in Edinburgh. Perhaps they enjoy the big occasions and Tuesday night was definitely one of those! 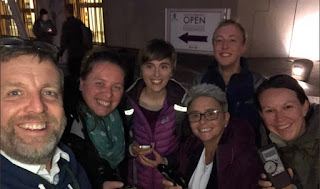 Through the Scottish Environment LINK, member organisations (which includes the Bat Conservation Trust (BCT)) were asking over 100 Members of the Scottish Parliament (MSP), who had accepted to become a Species Champion, to participate in a series of actions over a 100 day period (#Species100). We were asking them to help raise awareness about their selected species, the threats to their populations as well as the wider biodiversity concerns in Scotland. Taking part in the bat walk as part of this challenge were MSP’s Annie Wells, Finlay Carson and Fulton MacGregor who all attended on what was a wet and windy night at Holyrood. 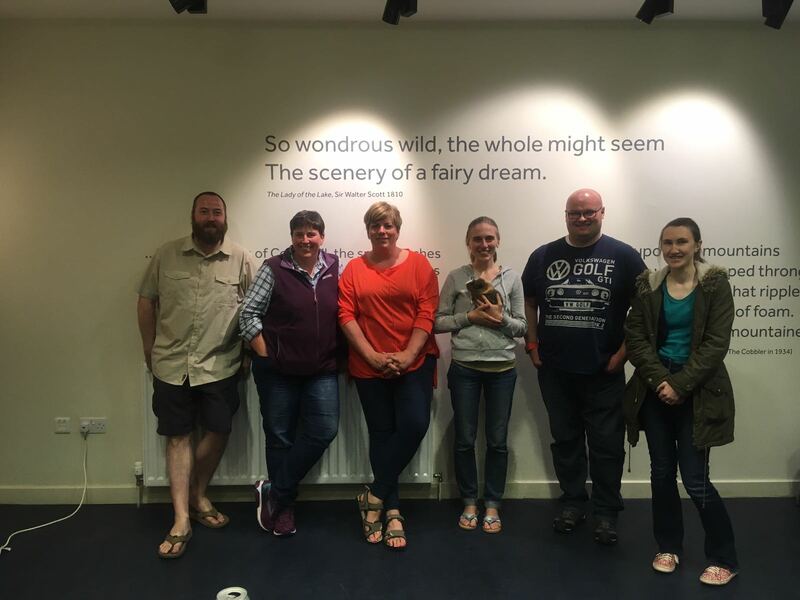 It needed more than rain to dampen their spirits however and it was lovely to chat to them about bats as well as their work as MSP’s. I am happy to say that their smiles remained there for the remainder of the night! Annie was very pleased to have her species, the common pipistrelle, foraging over her head and we watched as the bat continued to fly back and forth. The poor thing was fighting against the wind and we all agreed that he or she was a determined individual! Finlay was as keen as ever, even without the opportunity to see or hear his species, the Leisler’s bat. He is very passionate about his chosen species which is found in his constituency of Galloway. 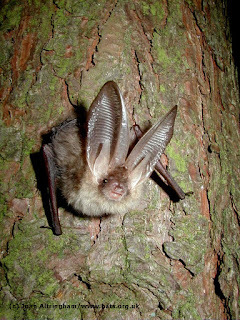 He has visited the Wood of Cree where these rare bats are fairly common. Fulton too has still to see his species, the natterer’s bat, and without visiting a roost (which I have promised him) it is a tall order! They are not as easy to find as our pipistrelle species are. But, he knows a lot about his species already and I have run a bat walk for him in his local constituency in August. LINK’s award-winning initiative “Species Champions” pairs MSPs with species that are under threat in Scotland. With almost 1 in 10 species in Scotland at risk of extinction, political support for protecting our precious natural environment has never been more critical. 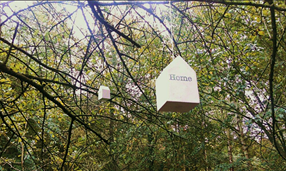 To find out more about this initiative check the Scottish Environment LINK’s website here. In the United Kingdom we have 18 species of bat, all are insectivorous and a great environmental indicator. A single bat can eat up to 3000 midges in one night making them an excellent natural insect controller, but unfortunately over the last century their populations have declined, making each roost important for future survival. 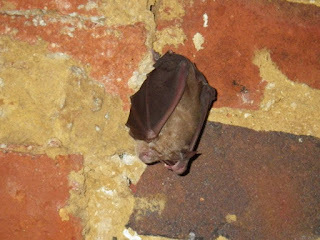 Due to their decline, bats and their roosts are protected under UK and European law with a roost defined as any place that a wild bat uses and is protected whether bats are present or not. 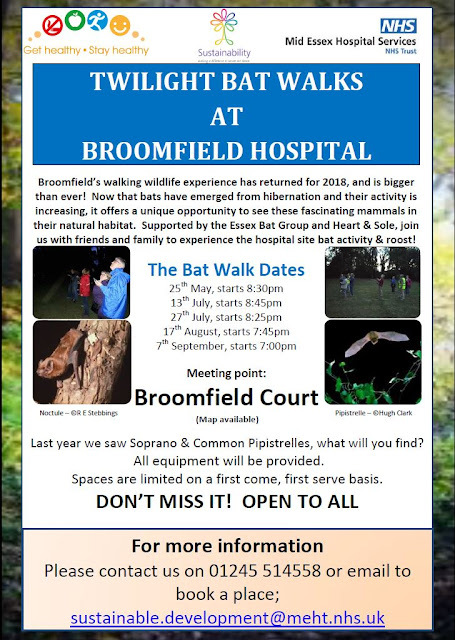 At Mid-Essex Hospital Services NHS Trust, we are proud to have high bat activity around our Broomfield Hospital site, with a bat roost of Soprano Pipistrelles known and monitored for several years. Both Soprano & Common Pipistrelles have been found foraging within our natural areas, feeding on insects during their summer months and highlighting our effective natural management on site. 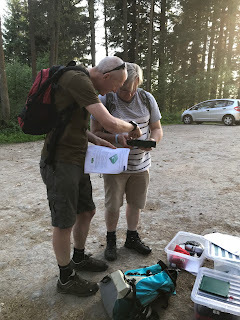 Bat walks offer a unique educational opportunity to experience these intriguing creatures, and in 2016 we launched an inaugural Twilight Bat Walk Programme, led by a local bat enthusiast. The walks proved to be a huge success, providing education in an endangered species whilst promoting healthy walking alternatives within Broomfield Hospital and community. Following on from these walks, a larger Twilight Programme was produced for the summer of 2017. Supported by the Essex Bat Group and Heart & Sole Walking Scheme the 2018 Twilight Programme is now available. Join us with friends and family to experience the hospital site bat activity and roost. What will you find? Spaces are limited, on a first come first serve basis. If you’d like to express an interest please contact David Jackson on sustainable.development@meht.nhs.uk or 01245 514558. Greywell tunnel is a disused canal tunnel on the Basingstoke Canal in north Hampshire. The 1,124m long brick lined tunnel was constructed in tandem with the canal between 1788 and 1794. The tunnel is approximately 5m high and has a maximum width of 4.5m. It was excavated through an area of changing geology from Hampshire chalk through Reading beds into London clay. There was a partial collapse in the tunnel during the 1930s and a further fall during the 1950s that left the bore of the tunnel blocked about 800m from its eastern entrance and at 130 m from its western entrance. Bat friendly grilles prevent public access to the site. Greywell tunnel has long been known as an important site for hibernating and swarming bats. It was designated a SSSI for bats in 1985. Hibernation surveys are conducted from a boat by a team of up to five surveyors. As you work your way into the tunnel light from the portal becomes a distant dot. 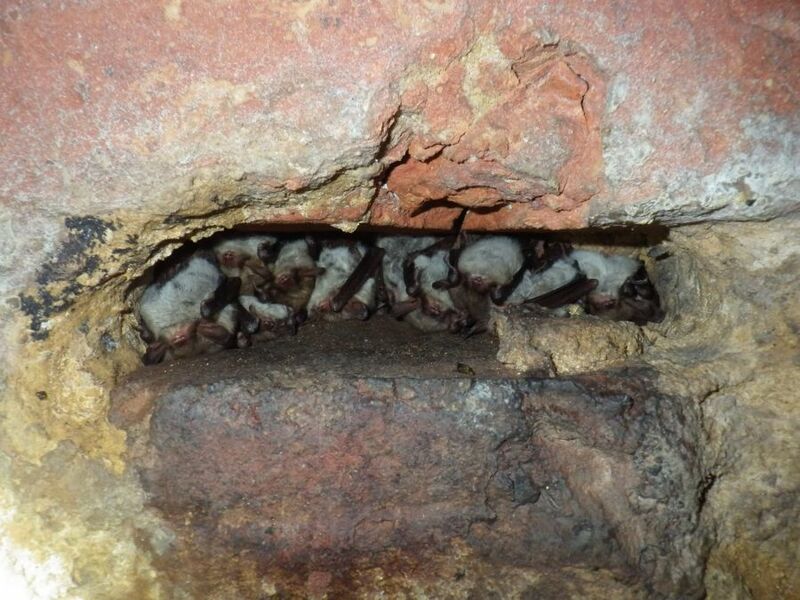 During hibernation counts many of the bats encountered are hanging against the brick lining, however a high proportion are often packed into crevices and openings in the brickwork left during the tunnels construction. Within crevices it’s sometimes a matter of counting ears and feet to get as accurate a count as possible and on occasion it’s not possible to record bats to species. 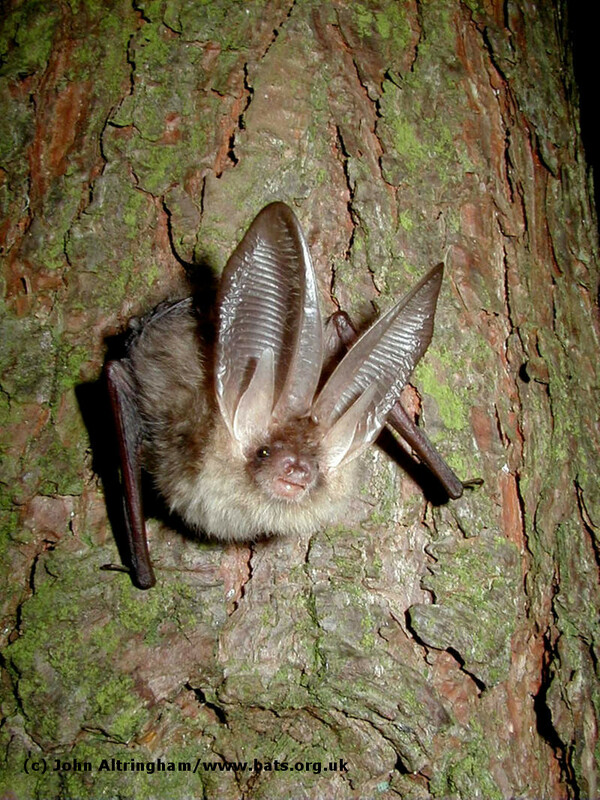 Natterer’s bat is the most commonly encountered species (highest count of 569 in 2013), Daubenton’s bat is also regularly recorded (highest count of 69 in 1986). We also often record whiskered, Brandt’s and brown long-eared bats. The count this January gave some very exciting results. We had our second highest count for Natterer’s bat in the eastern end (564) and our first ever record of a greater horseshoe bat. The horseshoe bat is an excellent record for North Hampshire. Bat Group records show it is the seventh on record; this includes two records for Winchester from the 1940s. Sadly after over 30 years of monitoring at the site, future regular monitoring is threatened by a recent move by the owners Hampshire County Council to declare it a Confined Space. 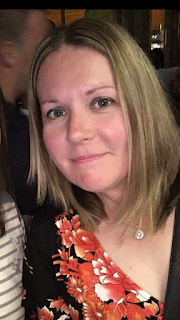 Now surveys can only be conducted once every two years due to the excessive costs of gas monitoring equipment and a rescue team stationed outside the tunnel. 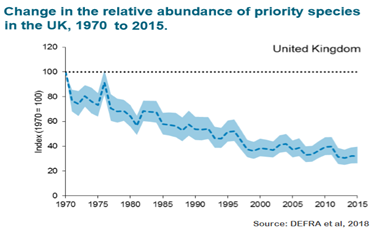 We do not feel that this is often enough to provide adequate data resolution for the SSSI condition assessment, but Natural England have said that it will be sufficient. Cities now support over half of the world’s human population. They also support endemic and threatened wildlife. This wildlife provides multiple ecological services to human urban populations, and also provides the daily contact with nature that most of us now experience. 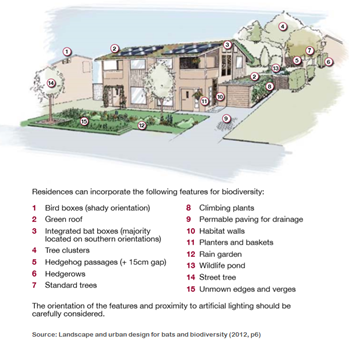 However, our understanding of how wildlife persists in urban environments, and how we can design and manage cities to provide the best possible habitat for wildlife is still not very well understood. One reason for this is due to the difficulties of assessing biodiversity, especially in cities. Human surveyors have to consider safety issues, survey equipment is vulnerable to vandalism, theft and destruction, and getting access to private land to conduct surveys can be very bureaucratic. 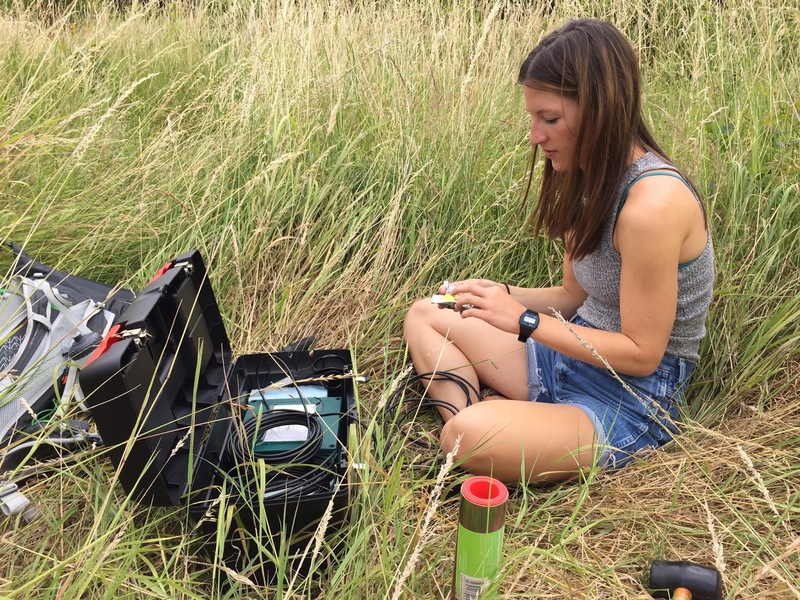 Through my Engineering Doctoral research (EngD) I developed new acoustic tools that can be used to make it easier to assess biodiversity in urban environments. These tools should hopefully be used in the future to better understand the biodiversity supported by cities and to inform the design and management of cities for biodiversity. Lots of wildlife produce sounds, either by vocalising – think a singing songbird - or through movements of their bodies – think the hum from the rapid wingbeats of a bumblebee. Some species also make sounds that cannot be heard by humans, such as the ultrasonic echolocations of bats. Ornithologists have used the species-specific calls emitted by birds to identify calling species for centuries. 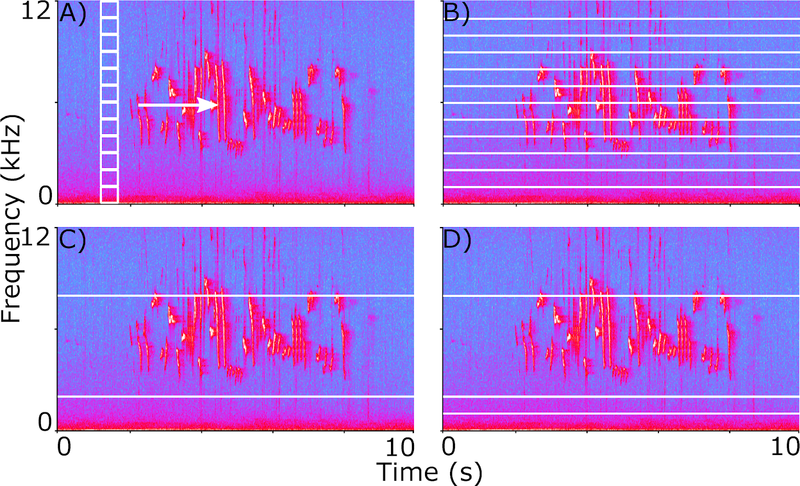 More recently, ultrasonic recorders have been used to record the species-specific echolocation calls of bats which can be used to identify species. But these examples are very species-specific. There are other species that live in cities such as insects and non-flying land animals like foxes and squirrels that also make sound. The field of ecoacoustics uses the sounds emitted by all species to get a measure of whole ecological communities, rather than focussing on specific species and species groups. Ecoacoustic theory posits that the soundscape (sounds at a landscape scale) of an environment is composed of biophony (sounds emitted by non-human organisms), anthrophony (sounds associated with human activities) and geophony (abiotic sounds such as wind and rain). 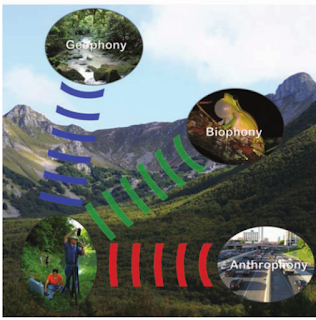 The three elements that compose a soundscape: biophony, anthrophony and geophony. Image credit: Pijanowski et al. (2011) BioScience. The use of ecoacoustics to monitor biodiversity has really been made possible by the development of passive acoustic recording technology, such as the very popular products from Wildlife Acoustics. These are weather-proof acoustic recorders that can be left outside for long periods of time, recording sound on a user-defined schedule. This technology is making it possible for biodiversity scientists and conservationists to collect vast amounts of acoustic recordings. 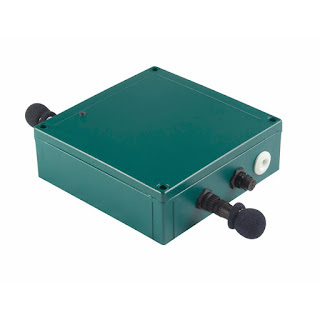 An SM2+ SongMeter is an example of a passive acoustic recorder that is commonly used in ecoacoustic research. These devices can be deployed in the environment recording at a pre-defined schedule for days/weeks/months at a time. Image credit: www.wildlifeacoustics.com. But what to do with all this acoustic data? It is not practical or efficient to spend days/weeks/years listening to the recordings that have been made. To overcome this Big Data problem, ecoacousticians have developed algorithms that can measure the biotic sound in acoustic recordings producing a proxy measure of biodiversity. 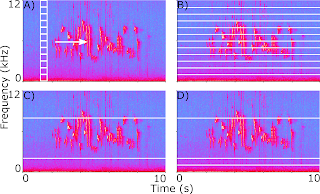 These algorithms are called acoustic indices and can be used to quickly produce measures of the biotic sound in large volumes of acoustic data. They measure a few characteristics of the acoustic data, such as the amount of sound at particular frequencies, to produce a summary measure of biotic sound within an entire sound recording. Acoustic indices produce measures of the biotic sound in audio recordings. Four commonly used acoustic indices include: A) Acoustic Complexity Index (ACI, Pieretti et al. 2011 Ecol. Indic. ), B) Acoustic Diversity Index (ADI, Villanueva-Rivera et al. 2011 Landscape Ecol. ), C) Bioacoustic Index (BI, Boelman et al. 2007 Ecol. Appl.) and D) Normalised Difference Soundscape Index (NDSI, Kasten et al. 2012 Ecol. Inform.). The ACI sums the absolute difference in signal power within frequency bins over time using a sliding window and defined temporal steps (indicated by arrow). The ADI is calculated as the Shannon’s diversity index for each recording based on the signal power occupancy of each 1 kHz frequency band. The BI calculates the signal power within 2-8 kHz frequency band of recordings. The NDSI calculates the ratio of signal power in the frequency bands between 1-2 kHz and 2-8 kHz to measure the level of anthropogenic disturbance on the landscape. However, ecoacoustic research and the development of acoustic indices has tended to focus on less disturbed environments than cities, such as temperate woodlands, coastal forests and Mediterranean scrub. The challenge of my EngD research was to see if ecoacoustic could be applied in this new, highly anthropogenically disturbed environment. I started off by assessing the suitability of a suite of commonly used acoustic indices for use in the urban environment. I collected low (0-12kHz) and high (12-96kHz) frequency audio recordings from 15 churchyard sites across the Greater London area. 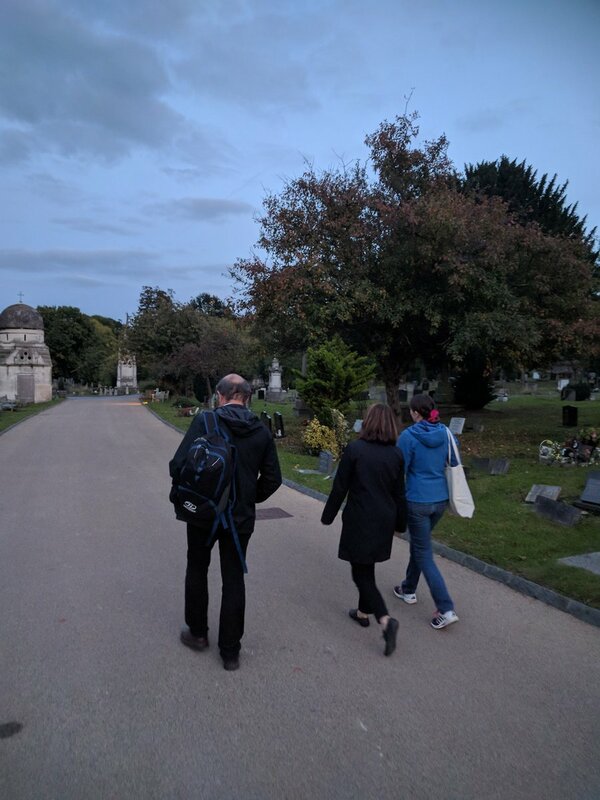 I was lucky to collaborate with the Diocese of London on this data collection while they conducted a London-wide ecological survey of their churchyards. To test exactly what sounds the acoustic indices measured in the acoustic data, I listened to and manually labelled the sounds in a random selection of my recordings. To do this, I co-developed AudioTagger, a bespoke audio analysis software that allows you to quickly listen to and view audio recordings, and draw labelled bounding boxes around sounds on spectrograms (a visual representation of an audio recording). AudioTagger in action. 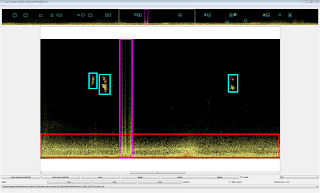 Sound recordings can be quickly listened to, viewed as spectrograms and annotated by drawing labelled bounding boxes around sounds of interest. Sounds labelled here include birds (blue boxes), electrical buzzes (pink) and road traffic (red). I identified a very wide range of sounds in my recordings. Anthropogenic sounds dominated the dataset and the variety was much greater than in previous ecoacoustic studies, including sounds such as road traffic, sirens, church bells, footsteps, and applause. Biotic sounds were mainly made by birds and bats, and geophonic sounds were either wind or rain. Of the four acoustic indices I tested, either the measures of the acoustic indices did not correlate with the amount of biotic sound in recordings, or were biased by non-biotic sounds in recordings (Fairbrass et al.2017). Therefore, I would not recommend that any of the acoustic indices I tested are used to assess biodiversity in urban environments. Machine learning algorithms learn to recognise patterns in data based on examples that they’ve seen previously, for example how a spam email application learns to filter emails based on what a user has previously marked as spam (skip to 32:38 for a great introduction to machine learning). Deep learning algorithms (a type of machine learning) choose by themselves what characteristics define different groups of data, rather than relying on humans to choose. Therefore they can use many more parameters within data to characterise groups than a human ever could, making them extremely powerful. Machine learning algorithms are potentially much more powerful than acoustic indices, as they do not rely on human defined characteristics of data. What they do rely on is having a large dataset of labelled data with which to learn the characteristics of different groups. 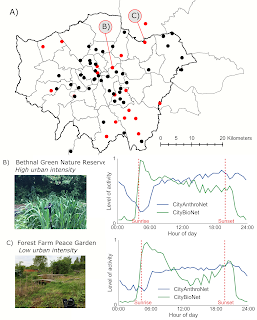 To train a deep learning algorithm that could measure biotic sound in audio recordings from the urban environment without being biased by the non-biotic sounds in the city, I collected audio recordings from 63 sites across the Greater London area. I used AudioTagger to label all the biotic, anthropogenic and geophonic sounds in a random selection of 45 minutes of recordings from each of the 63 sites. This labelled data was used to train and test a pair of Convolutional Neural Network algorithms, CityNet (Fairbrass Firman et al. in review), which produce a measure of biotic and anthropogenic acoustic activity in noisy acoustic recordings from the urban environment. The algorithms can be used to produce summaries of the biotic and anthropogenic sound in large volumes of audio data from cities – at http://londonsounds.org/ you can explore the patterns of biotic and anthropogenic sound at my 63 study sites. An open question that remains in ecoacoustics is whether biotic sound is a good proxy measure for biodiversity? And does more biotic sound mean more or better biodiversity? Some have argued that due to the way species avoid calling at the same time and frequency, more sound does correlate with more diversity, but that this relationship only holds in the tropics (Krause & Farina 2016). To investigate whether biotic sound can be used as a proxy measure of habitats in cities, I conducted habitat surveys at all my study sites and compared local and landscape habitat measures with the biotic and anthropogenic acoustic activity and diversity. 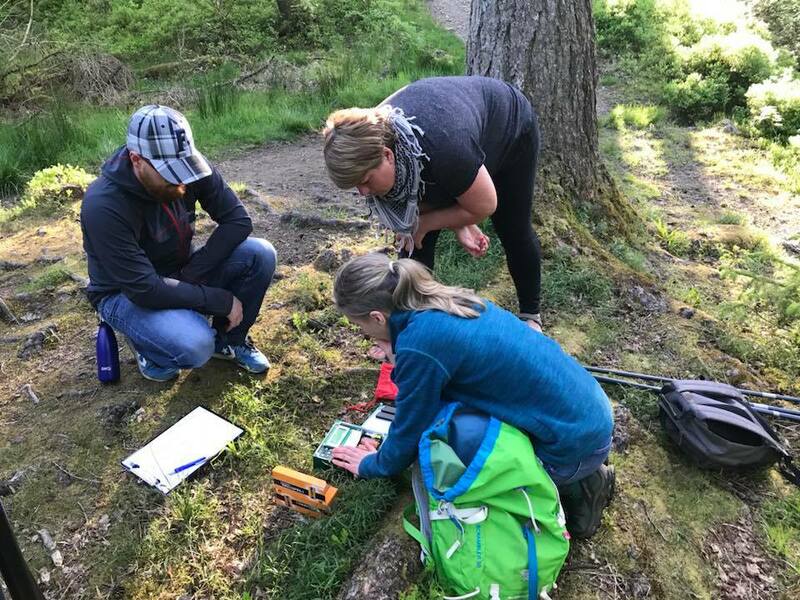 Initial results suggest that there is a relationship between the biotic sound recorded at a site, and the characteristics of the local and landscape habitat. However, this research needs a bit more work before I’m confident in the results, and I will continue to work on this to try and answer the question of whether biotic sound can be used as a proxy measure of habitats in cities. In this research I have found that existing ecoacoustic tools in the form of acoustic indices are not suitable for use in cities as they either do not measure biotic sound or are biased by non-biotic sounds in recordings (Fairbrasset al. 2017). To overcome the shortcomings of acoustic indices, I have developed deep learning tools, CityNet (Fairbrass Firman et al. in review), which measure the biotic and anthropogenic sound in acoustic recordings made in noisy urban environments. Finally, I have found that biotic sound may be a good proxy for the characteristics of habitats in cities. 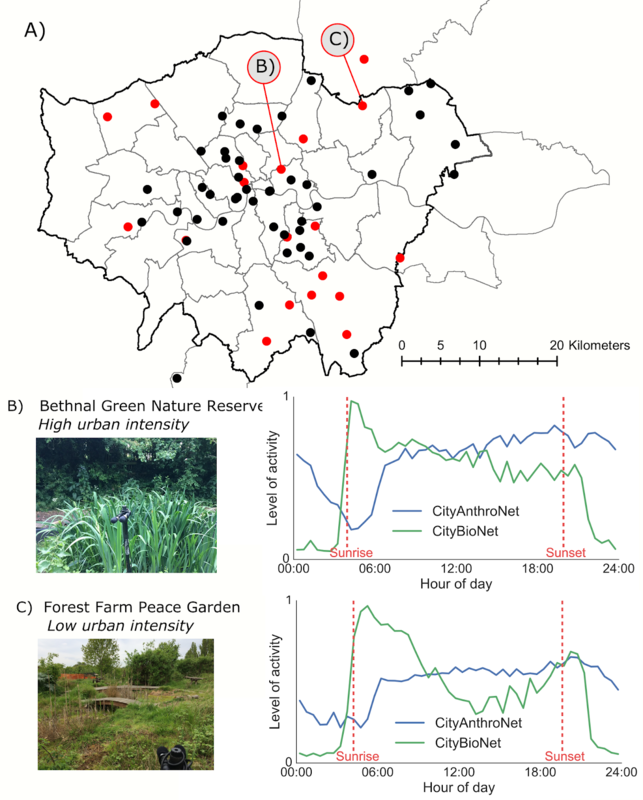 Cities are exciting places in which to develop new technologies for assessing biodiversity because the availability of power and Wifi connectivity makes it possible to develop autonomous systems for monitoring wildlife. For example, smart sensors and machine learning algorithms have been used to develop the world’s first end-to-end system for monitoring bat populations in the urban environment (www.naturesmartcities.com ). I think it is important that machine learning and sensing technologies continue to be used to improve our understanding of wildlife in cities, enabling us to design and manage better cities for the future.